Art and craftsmen in Bidart, near Biarritz. Our creations Artzaina, Mizpira and Bixia are about Basque Country's traditions and soil. 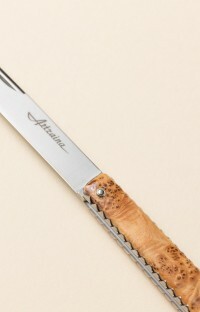 Artzaina, the shepherd is available in pocket knife or tableware. Artzaina - The shepherd - Filed model and design. Just like the makila, the ancestral walking stick of the basque shepherds, Artzaina is made of straight lines, medlar wood and chiseled metal. Proud ambassador of our crafts know-how, Artzaina is both a strong and reliable partner and a precious accessory with timeless elegance. 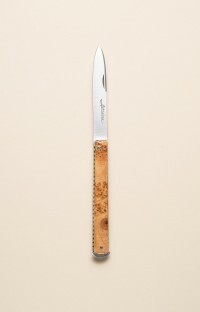 Basque knife Artzaina 12 cm or 10,5 cm made of stabilized mammoth ivory. Artzaina is sold with its bull-calf leather sheath made by hand. 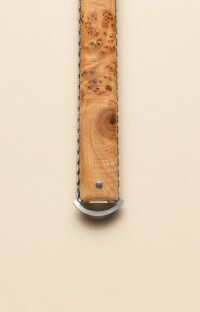 Satiny blade 12C27. Connector boards chiseled and glossed by hand. Forced notch spring. 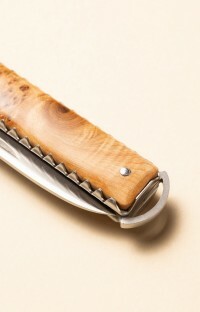 Handle made of stabilized mammoth ivory.